Shannon ran for Wilmington High School and in 1984, he was Division II State Champion in both the 100m (:10.7) & the 200m (:21.6) events. He was also 1984 New Castle County Champion in the 200m dash and tied the State Record in the trials of that meet with a time of :21.2. Shannon went on to run for Jackson State (1984-85) and Grambling (1985-86). He came back to Delaware and began coaching at his old alma mater, Wilmington High School. He was the sprint coach at Wilmington H. S., which became the Charter School of Wilmington/Cab Calloway School of Performing Arts in 1999. 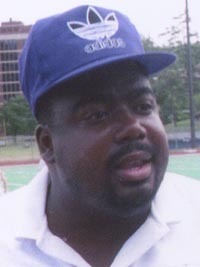 During his coaching career, Shannon’s 4 x 200m team won the1999 indoor championships at the University of Delaware. Shannon was one of the co-creators of the 400 Elite Track Club, which took local athletes to National meets around the country. Shannon is tied for 1st on the Delaware H. S. All-Time Performance List (Outdoor) in the 200m with a converted time of :21.40. Sadly, Shannon died in February, 2004.